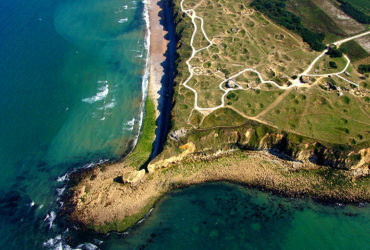 Green hills, dunes and exceptional cliffs make Normandy’s charm. A history of landings from the Vikings to the D-Day landing in June 6, 1944. 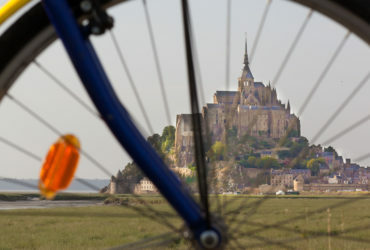 Normandy is a favorite destination for cycling enthusiasts. 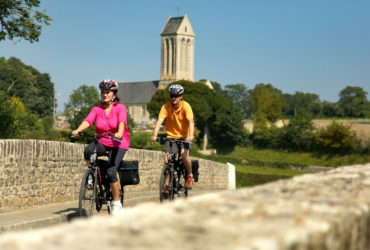 Through a great diversity of coastal landscapes, its countryside with forests, plains or hilly groves, cycling routes and small roads will lead you to discover the rich historical and cultural heritage of Normandy. Your taste buds are not left behind thanks to a rich gastronomy. Along the coastline with the landing beaches and the fishing and sailing ports, as well as its towns and villages worthy of interest, Normandy promises to combine cycling and discovery. The beauty and variety of Normandy’s landscapes have attracted many famous painters. Monet, Courbet, Manet have, among other things, contributed to the global reach of the region. But the Norman imagination has also inspired great names in literature as Flaubert, whose famous novel Madame Bovary plunges us into the heart of Normandy in the mid-nineteenth century or Maupassant, who settled in Etretat. Normandy is also a place steeped in historic places and events. 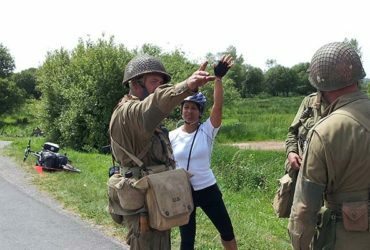 From Caen to Bayeux via the landing beaches, the visitor is transported through the history of France, Europe and the world. During your bike stay, you may have the chance to participate in one of the major traditional fairs such as Lessay which welcomes nearly 400,000 visitors each year and the oldest date back to the 11th century. You will be able to taste the culinary specialties of the local terroir which are the pride of the Normans such as grilled mutton and the inevitable camembert, all interspersed with the traditional “norman hole”, glass of Calvados, the local brandy. The village festivals, meanwhile, regularly highlight folk groups and traditional dances where the traditional costumes of the nineteenth century Norman come out. Meet the Normans and their region rich in traditions, history and lifestyle. 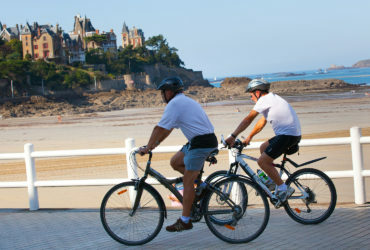 The Normandy region is a favorite destination for cycling holidays. There are more than 550 km of cycle routes developed as greenways. 4 main itineraries allow you to discover the region and its landscapes: The landing beaches to the Mont-Saint-Michel, The Avenue Verte London-Paris from Giverny to Dieppe, The Véloscénie from Perche to the Mont-Saint-Michel and the Tour de Manche from Cherbourg to the Mont-Saint-Michel..
You can also venture on the Vélo Francette® towards the Atlantic Ocean to complete your discovery of Normandy in complete safety. The projects are not lacking with the development of the banks of the Seine which by 2020 will connect Geverny to Le Havre over nearly 250 km. Bordered by the Channel, Normandy offers a temperate ocean climate. The seasonal amplitudes are low, which allows moderate summer temperatures suitable for cycling stays, around 20 ° C. The region is very rainy in autumn and winter but in summer it varies depending on the area where you are. The coast is generally sunny but the cyclist is not protected from the wind! Inland, there are also disparities related to hilly terrain.